At SeavorChartered pride ourselves on providing a tailored, one to one personal service. We place emphasis on building strong relationships with our clients and really understanding their business and tax affairs. Having Chartered Status means our clients can have absolute peace of mind that we deal with their affairs in an honest and professional way. We have access to the very latest changes in accountancy and taxation ensuring that clients are aware in a timely manner of changes that will affect them. We aim to provide valuable first class support to our clients through our range of accounting, taxation and business advisory services. We will provide high quality, fair priced services which are tailored to our clients’ individual needs whether that be completing a tax return in a timely manner with the utmost confidence and integrity or researching thoroughly to give the best advice on more complicated tax matters. 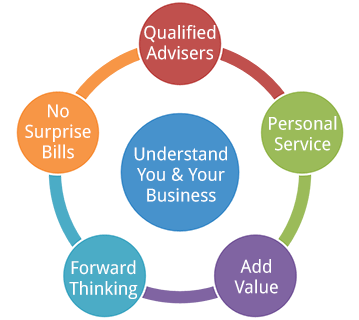 Having over a combined 20 years experience advising small and medium sized businesses together with our passion for success, we believe we are best placed to help our clients grow their business profits and their personal wealth. We promise to go the extra mile in all that we do in order to support our clients when overcoming their challenges and help them to achieve their goals. We aim to become a regionally recognised brand name and be an integral part of the lives of our clients and our community.